. A number of defendants in Belgium, France and the Netherlands did not appear before the court and were sentenced in absentia. Eurojust received contributions containing information on terrorism-related court decisions in 2016 from the following Member States: Austria, Belgium, Denmark, Estonia, Finland, France, Germany, Greece, Hungary, Italy, Lithuania, the Netherlands, Portugal, Slovenia, Spain, Sweden and the United Kingdom. As in 2014 and 2015, the UK contribution for 2016 covers England, Scotland, Wales and Northern Ireland. The UK contribution includes proceedings on offences under antiterrorism legislation, as well as other offences assessed to be terrorism related. Similar to 2014 and 2015, the UK data for 2016 refers only to convictions. In case a verdict pronounced in 2016 was appealed and the appeal was concluded before the end of the year, Eurojust counted the proceeding as one and reported only on the latest/final verdict. According to Council Decision 2005/671/JHA, the information to be submitted to Eurojust is in relation to final convictions. Due to the specifics of reporting, Member States submit information on both final and not final decisions. Therefore, reference is also made to those decisions pending judicial remedy and they are included in the reported numbers. The data provided by the United Kingdom did not distinguish between final verdicts and verdicts pending judicial remedy. As reported, all convictions in the United Kingdom are effective from the moment of their being pronounced, even if an appeal is made.
. This confirms the findings in 2015 when, for the first time since 2008, the concluded court proceedings in the EU resulted in a higher number of verdicts for jihadist terrorism offences than for separatist terrorist offences. As evidenced in the past couple of years, the majority of the verdicts for jihadist terrorism concerned offences related to the conflict in Syria and Iraq. They involved persons who had prepared to leave for or have returned from the conflict zone, as well as persons who have recruited, indoctrinated, financed or facilitated others to travel to Syria and/or Iraq to join the terrorist groups fighting there. Individuals and cells preparing attacks in Europe and beyond were also brought before courts. Similar to 2015, courts in Belgium rendered the highest number of verdicts concerning jihadist terrorism in 2016 (138). A large number of such verdicts were also rendered in Germany and the Netherlands. In Belgium, as well as in seven other Member States, only verdicts concerning jihadist terrorism were pronounced in 2016. Those include Austria, Estonia, Finland, France, Italy, Portugal and Sweden. The Brussels Criminal Court, for example, sentenced 15 men – with nine in absentia – to prison sentences of up to 15 years for membership in a terrorist organisation and planning of terrorist attacks. The defendants formed the so-called Verviers cell, which had ties with persons involved in the November 2015 terrorist attacks in Paris. Three of the defendants present at trial were considered to be the leaders of the cell, each receiving a 16 year sentence. The court found that one of them had travelled to Syria to receive instructions on targets, while the others had been responsible for arranging the logistics, including securing a safe house in Verviers and obtaining weapons and chemicals needed for the planned attacks. Another defendant received a sentence of 30 months in prison for helping a radicalised family member to travel to Syria in order to fight for IS. Similarly, another cell member received a 3 year sentence on probation for having attempted to join IS in Syria. The defendants convicted in absentia received sentences of 5 to 7 years in prison. Most are considered foreign terrorist fighters who left for Syria to fight in the ranks of IS. Also in Belgium, the Court of Appeal of Brussels confirmed the guilty verdict pronounced in July 2015 by the Court of First Instance of Brussels against a leader of a terrorist group that had recruited and sent fighters to Syria. The Court of Appeal handed down a 15 year prison sentence, which is 3 years longer than the one given in first instance. The same sentence of 15 years was ordered for another person, who had received a penalty of 8 years’ imprisonment in July 2015. The prison terms of two other group members were also increased. All four were part of an organised network that had recruited, indoctrinated and facilitated the travel to Syria of potential fighters. One of the group members sentenced in absentia is believed to have played a major role in the attacks that took place in Paris on 13 November 2015. He was reported dead following a police action in the aftermath of the attacks. Another one, also sentenced in absentia and suspected to have been plotting terrorist acts, was arrested in March 2016 in France. 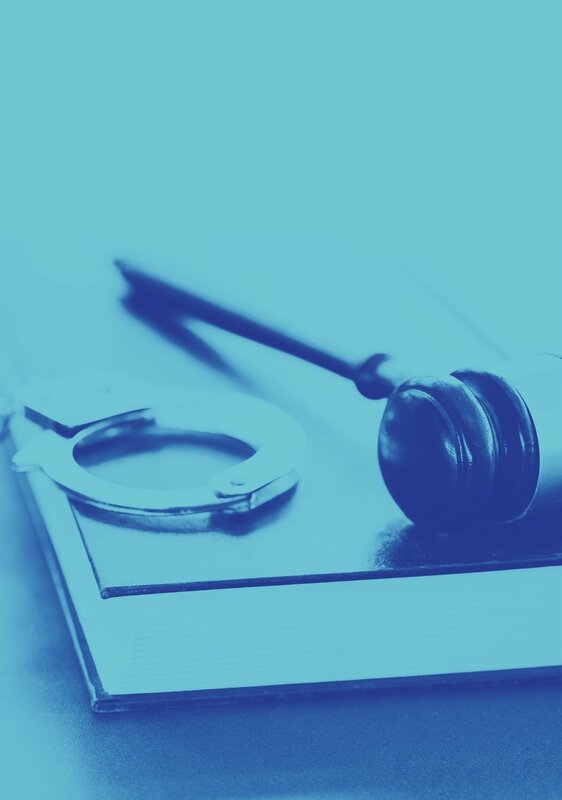 In France, seven men including the brother of one of the 13 November 2015 Paris attackers, were convicted by the Paris Criminal Court on 6 July 2016 to sentences of 6 to 9 years for participating in a criminal conspiracy to carry out terrorist attacks. They had travelled to Syria, where they had been trained by IS and fought in the ranks of the terrorist organisation. The men were part of a larger group that had travelled to Syria at the end of 2013. After two of the initial members had been killed, the rest – except one of the 13 November attackers – returned to France in April 2014, to be arrested a month later. The prosecutor in this case used wiretaps and various jihadi-inspired materials taken from the defendants’ devices as evidence. However, this conviction is not final as the public prosecutor has appealed. In another case against a terrorist group with international ties in Italy, four members of the Merano cell of the Rawti Shax group were convicted by the Court of Assizes in Trento of planning terrorist attacks throughout Europe. The leader of the group was sentenced to 6 years in prison, while the other three members of the cell to 4 years respectively. The defendants had as their stated aim the establishment of a theocratic state and the overthrow of the government of Kurdistan. The prosecution built its case on intercepted communications which showed that, despite the transnational nature of the Rawti Shax group, the Merano cell operated to a large extent independently. Its members were able to engage in fundraising and were theoretically capable of carrying out the attacks referred to in their communications. The Merano cell members were arrested as part of a big multinational operation coordinated by Eurojust in November 2015. With regards to evidence, an interesting precedent was set by the District Court of Glostrup in Denmark, which was the first court in Europe to refer to a questionnaire/form used by IS. The form offered the possibility to indicate one’s role for IS and was made available by foreign authorities. It contained information on a Danish citizen charged with terrorist offences. In the form, he had been registered as a fighter. Reference to the form was made when questioning the accused about his role within the terrorist organisation. The court held that his statement about his tasks, mainly cooking and serving food, was not reliable. Based on this and other evidence, the accused was found guilty, amongst other charges, of joining a terrorist organisation and sentenced to 6 years’ imprisonment. The intense propaganda, recruitment and indoctrination strategy applied by jihadist terrorist groups is also evident in the verdicts pronounced in the EU. In Spain, for example, the Audiencia Nacional found seven Spanish and Moroccan nationals guilty of terrorist indoctrination. Directed by IS, the seven had formed a terrorist cell that managed a number of social media accounts used to disseminate terrorist propaganda, glorify the jihad and praise IS. The accounts were also used to recruit persons who would later join IS in Syria and Iraq or commit terrorist acts in Spain. The accounts attracted a lot of followers who sympathised with IS and its terrorist activities. Some of those followers were selected as ‘most suitable’ and were brought in contact with a cell member located in Turkey who would help them reach Syria or Iraq or collaborate with IS in another manner. All seven cell members were handed down prison sentences of 3½ to 7½ years. In another case, one defendant was sentenced to 3½ years’ imprisonment after the court found him guilty of self-indoctrination. Further to verdicts concerning jihadist terrorism, Spanish courts dealt with the highest number of separatist terrorism cases in the EU in 2016. The vast majority of those cases concerned the terrorist organisation ETA. Individuals charged with offences related to other separatist terrorist groups (e.g. the PKK and LTTE) were tried in Denmark, Germany and the Netherlands. Greece was the only Member State that reported verdicts for left-wing terrorist offences, while courts in Hungary, the Netherlands and Spain also tried right-wing terrorism cases. The highest number of female defendants in the concluded proceedings in 2016 were tried for separatist terrorist offences (22) and for jihadist terrorist offences (also 22). The data provided by the United Kingdom was not broken down by type of terrorism and is therefore not included in the numbers that follow.
. Germany remains the only Member State where prosecutions for terrorist offences led to guilty verdicts and no acquittals in the period 2010-2016. The prison sentences ordered by the courts in 2016 ranged between 6 weeks and 397 years. In some cases (part of) the sentence was suspended or made conditional for a certain period of time. In other cases guilty verdicts were handed down but no penalty was yet ordered at the time of reporting. 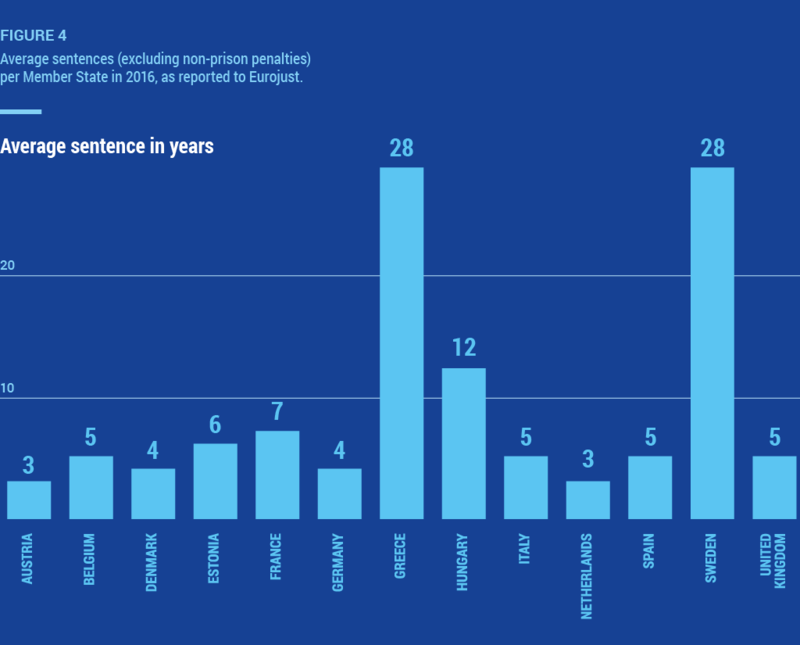 In several cases in Greece, Sweden and the United Kingdom the court ordered life sentences. In another case in the Netherlands the court pronounced a guilty verdict but imposed no penalty based on Article 9a of the Criminal Code. The court considered the defendant’s acts as a onetime misstep and recognised the efforts he had made to re-integrate into Dutch society.
. The majority (67%) of the penalties handed down with the guilty verdicts in 2016 were of up to 5 years’ imprisonment, which is slightly higher than in 2015 (61%) and less than in 2014 (70%). The number of sentences of 10 and more years’ imprisonment decreased to 12%, compared to 20% in 2015. For the purpose of the calculation of the average prison sentence, penalties exceeding 40 years of imprisonment and life sentences were counted as 40 years. In the cases where the court ordered a minimum number of years of the life sentence to be served, the sentence was included in the overview with the minimum number of years indicated. The data provided by the United Kingdom was not broken down by type of terrorism and is therefore not included in the overview.